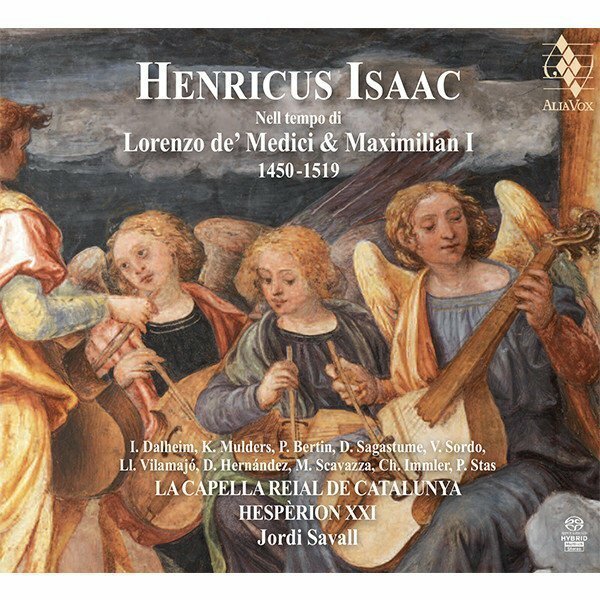 With the release of this new recording dedicated to Heinrich Isaac, in memory of the 500th anniversary of his death, ALIA VOX pays tribute to one of the greatest Renaissance composers. Heinrich or Henricus Isaac, as we shall call him, was born in Brabant but spent most of his life travelling around Europe, from his native Flanders to the court of Burgundy, Austria, and then Italy and Germany. At the invitation of Lorenzo the Magnificent, in 1488 he moved to Florence, the city he continued to call home through all his travels, and where he became a highly regarded and much admired member of the Medici court. Some years after the death of Lorenzo the Magnificent in 1492, he also became the principal composer at the court of Emperor Maximilian I of Habsburg (1497) until his death, and, notwithstanding his extensive travels, spent most of his time in Florence. An extremely prolific and innovative composer, Isaac left one of the most important musical legacies of his day and was distinguished by his absolute mastery of the art of counterpoint and polyphony – an art in which he was supremely gifted, both in his religious works and his secular songs and instrumental music. We echo the opinion of Anton Webern, who observed that Isaac’s compositions, which in terms of their absolute mastery of counterpoint are comparable to those of other illustrious Flemish composers such as Pierre de la Rue, Jacob Obrecht and Josquin des Prés, clearly stand out from his contemporaries in “the unfailing and exceptional vivacity and independence of the voices” (Anton Webern, 1906) in his many beautiful, complex forms of polyphony. 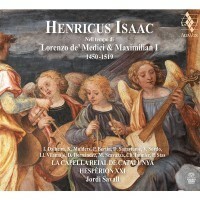 Until 1680, and although the sublime art of his music was recognized and highly acclaimed throughout Europe both during his lifetime and after his death, Isaac’s work was gradually relegated to the vaults of libraries and musical archives; more than 400 years were to pass before there was a revival of interest in his music. 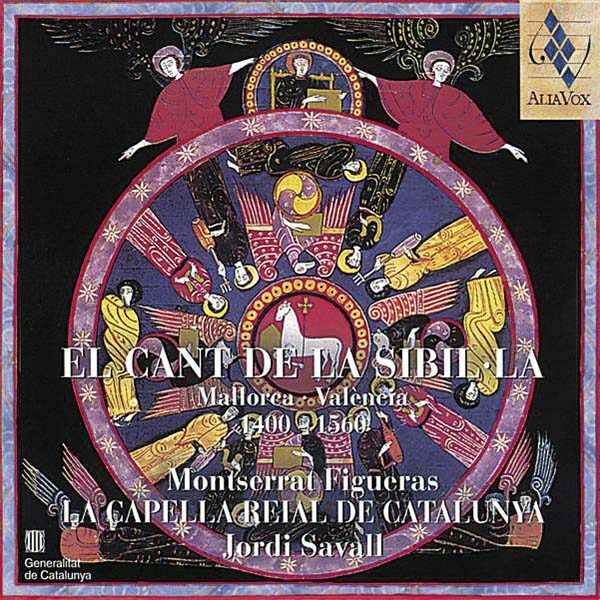 During the process of preparation, study and performance of this selection of magnificent choral works by Isaac with the solo vocalists of La Capella Reial de Catalunya and the musicians of Hespèrion XXI, I often wondered and speculated about the reasons for this lack of knowledge and recognition of such a great composer. How was it possible that so much of the work of such a great genius was so little known in the musical world of the 21st century? Was it a question of ignorance or historical amnesia? Or was it the consequence of a lack of interest on the part of performers, musical institutions and concert programmers? It should be borne in mind that at that time people believed in progress in the art of music, whereby each new generation of composers ushered in new musical forms, thus rendering the works of earlier generations obsolete. Let us not forget that music only truly exists and comes to life when it is sung by a voice or played on an instrument. When that music ceases to be played, it is unjustly considered less modern than the works of recent and contemporary composers, and all memory and trace of its existence begins to be lost. Consequently, all these wonderful compositions were gradually consigned to the long sleep of oblivion, which was to persist until the end of the 19th century and the beginning of the 20th century. The fact that it was still very difficult to access the original, together with the dearth of modern editions that were faithful to the original sources, merely prolonged this already long amnesia. This is precisely the subject addressed by the great writer and poet Aldous Huxley in his eloquent essay entitled “Gesualdo: Variations on a Musical Theme”, written around 1960. In the essay, he cites Isaac as one of the great unjustly forgotten composers of the Renaissance and reminds us of the circumstantial causes leading to that unjust oblivion, which in his view was the result of “the tragic loss of memory suffered by European musical awareness, an amnesia which persisted until the end of the Second World War. As late as the 1950s, the musical repertoire before Monteverdi, which lay buried under the successive cultural layers of modernism, was still waiting to be rediscovered.” Let us not forget that even one of the great masterpieces, Monteverdi’s Vespro della Beata Vergine, composed in 1610, was not performed again in modern times until 1935! The origins and the consequences of this lamentable misconception are to be found in the great cultural upheaval that took place at the beginning of the 15th century. It was the period which would later be called “the Renaissance”, in reference to a vigorous new flourishing of the Arts, influenced and inspired by the discovery of the artistic treasures of the extraordinary Greek civilisation (treasures which would subsequently become models that inspired and shaped a fabulous and totally new artistic departure). What actually happened is almost banal: the arts which were “reborn”, inspired by the still extant and accessible ancient artistic creations, were the “tangible” arts – in other words, those which the artists of the 15th century could “see”, “touch” or “read”. Obviously, music, the most spiritual and therefore “intangible” of all the arts, went untouched by the Renaissance, because the composers of that period were not able to take their inspiration from the music of Ancient Greece; indeed, sadly, nobody could “listen to” or even “read” an ancient legacy kept alive for two thousand years through oral transmission, and of which nothing tangible remained. Aside from the numerous philosophical texts, which refer to the importance of music in education and everyday life, no written accounts survive of what the musical life of the Ancient Greeks was really like. Lacking any tangible information, 15th century musicians were unable to reconstruct or even to imagine the musical equivalent of the great epic and dramatic texts such as Homer’s Iliad. The existence of refined works of art dating back more than two thousand years was evident in all the other arts, proving that there was no such thing as progress when it came to art; instead, there were sublime, transcendent creations which nevertheless bore the imprint of their age. 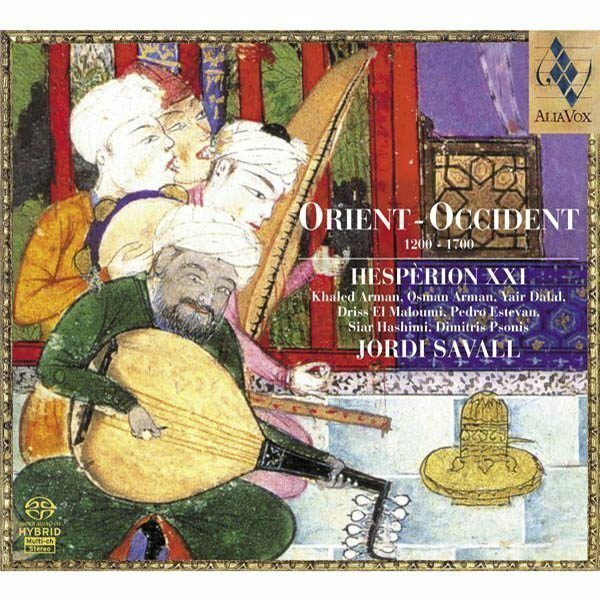 Unfortunately, finding no trace or proof of the musical genius of the Ancient Greeks, musicians continued to confuse the evolution of musical language and style with the notion of progress until well into the 19th century, as witnessed by Stendhal’s The Lives of Haydn, Mozart and Metastasio (1806). Eventually, one hundred years later, in the 20th century, there emerged a new awareness of the importance of Isaac’s work. In 1902 a 19-year-old student called Anton Webern submitted his dissertation on the edition of the second book of Propers of the Mass of Isaac’s Choralis Constantinus as part of his musicology studies at the University of Vienna under the direction of Guido Adler. This profound interest in Renaissance music and Heinrich Isaac’s music, in particular, was to be a great influence on Webern’s own compositional technique, and during his studies under Arnold Schönberg, which he concluded in 1908 with the publication of his Passacaglia, Op. 1. Together with Alban Berg, another of Schönberg’s disciples, he was to become one of the great composers of the dodecaphonic and serial school. It is in the preface to this edition of the Choralis Constantinus that he draws our attention to the importance of the late 15th century composer and explains with wonderment what he admires about Isaac’s art of composition. The programme for our CD was conceived as a true “musical homage” that could illustrate in the brief space of a recording the immense richness and creative diversity of this great Renaissance composer. We also offer a short, chronological evocation of some of the key events in the life of this great musician, as well as the key moments in history for which his music was composed or performed; these works include A la battaglia, which illustrates the battle between Genoa and Florence for Sarzanello Castle, and Quis dabit capiti meo aquam, a deeply moving lament composed on the occasion of the death of Lorenzo de’ Medici. Because we begin our musical journey with Isaac’s birth, we have included some exceptions to our chronological musical narrative, choosing to illustrate the early years of his life with some of his most beautiful compositions (naturally written several years later): these include the instrumental piece Palle, palle, which evokes the fanfare of the Medicis and serves as an introduction to the programme of music on this CD, the motet Parce, Domine composed on the death of Cosimo de’ Medici in 1464 and the motet Sustinuimus pacem, with which we symbolically celebrate the signing of the Treaty of Picquigny in 1475 between Louis XI of France and Edward IV of England, marking the end of the Hundred Years War. The beautiful song Innsbruck, ich muß dich lassen illustrates Isaac’s departure from Innsbruck (1484? ), although the sources of its discovery date from somewhat later. The Florentine carnival song Hora e di maggio evokes his arrival in Florence (1485) and his subsequent marriage. The great motet Sancti spiritus assit nobis gratia, composed in honour of Maximilian I at the beginning of the Imperial Diet at Constance, evokes the celebrations in honour of his succession, following the death of Emperor Frederick III, as the new Holy Roman Emperor in 1493. The Motet for 6 voices Angeli, Archangeli reminds us of the remarkable “Perpetual Peace” between all the Nations of the Holy Roman Empire, decreed by the Diet of Worms in 1495. 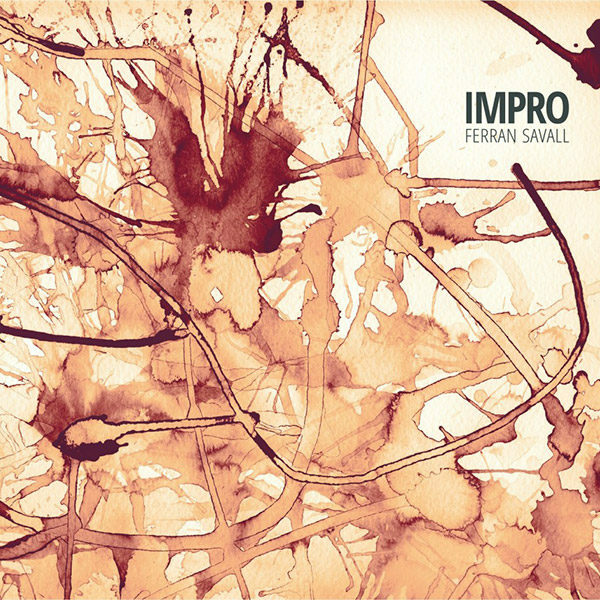 The instrumental canzona La Mi La Sol recalls his time at Ferrara (La Mi La Sol are the notes of the Duke of Ferrara’s musical motif) about 1502. And what better than the impressive motet Optime divino / Da pacem / Sacerdos et pontifex (1514), the text of which refers to Giovanni de’ Medici as Pope Leo X, to conjure up the solemnity surrounding his coronation in 1513, a ceremony that Isaac attended as the Medicis’ guest of honour. Another very moving moment is the musical evocation of Isaac’s death on 26th March, 1517, with the performance of the chorale Circumdederunt me gemitus mortis, one of the most poignant funeral prayers from the Choralis Constantinus cycle (transcribed and published in 1906 by Anton Webern). Six months later, on 31st October, Luther published his theses against Rome, marking the birth of what would later become the Protestant Lutheran Church, which is evoked here with the spiritual text O Welt, ich muss dich lassen, adapted to the music of the song Innsbruck, ich muß dich lassen, a typical contrefacta which rapidly gained popularity as a Protestant chorale. And finally we conclude by evoking the celebrations for the coronation of Charles V as King of the Romans at Aachen in 1520, his coronation as Holy Roman Emperor by Pope Clement VII finally taking place at Bologna in 1530. This event is illustrated by the Contrefactum of one of Isaac’s loveliest motets, Virgo prudentissima prudentissima (composed for the Imperial Diet of Constance in 1507), whose text celebrates Maximilian I as Holy Roman Emperor), adapted using the new text Christus, filius Dei by an anonymous author (after 1520) in which the original text referring to Maximilian as Cæsare Maximiliano is replaced by the words Carolo Cæsare romano in reference to Charles V as Holy Roman Emperor. Given the considerable formal grandeur and rich polyphonic complexity of some of the motets we have selected (Angeli, Archangeli for 6 voices, Christ ist erstanden for 5 voices, Imperii proceres Romani, etc.,) and the often exceptional occasions on which his works were performed (coronations of Emperors, Imperial Diets, etc. ), we decided to use quite a large choir and orchestra: a vocal ensemble of 8 soloist singers and 6 ripieno singers, and an instrumental ensemble of 13 instruments (including 6 wind instruments, 4 viols, organ, lute and percussion), which enabled us to perform certain motets with the addition (in the cantus firmus and the solemn tutti passages) of the appropriate instrumental colours and, at the same time, to play some of the composer’s major instrumental pieces, such as A la battaglia, the fanfare of the Medicis Palle, palle and the instrumental Motet/Canzona La Mi La Sol, which Isaac composed in 1502 after spending time at the court of the Duke of Ferrara. This homage to Henricus Isaac was first performed at Drassanes Reials in Barcelona on 22nd December 2016 as part of L’Auditori’s “El So Original” early music season, the recording being made the day after the concert, thanks to the extraordinary artistic and personal dedication of all the singers and musicians who took part in this project. I would like to take this opportunity to express my deep gratitude and warmest thanks to the musicologist Dr. Stefan Gasch, not only for his excellent commentary on Henricus Isaac, but also for his additional critical reflections on the project and his essential collaboration on the sources and historical references for Isaac’s works and the corresponding historical events.